One of the characteristics of the Japanese garden is the use of stone as a major component of landscapes created in a garden context. Since the very earliest dates of creating gardens in Japan (8th century), stones and their placement has been an important element. Given that the original inspiration for creating gardens came into Japan from China it is not great surprise, as stones have always held a dominant position in the Chinese garden culture. In both China and Japan gardens are recreations of landscape, or at least the attempt to create something of the perceived ‘essence’ of landscape. The term for landscape in Chinese is shansui, 山水 (sansui in Japanese); this is composed of two characters, the first reading ‘mountain’, and the second ‘water’. Thus the essence of landscape is encapsulated by the concept of ‘mountains and water’. It is interesting to note in passing that the dominant element in the composition of Chinese landscape paintings are also mountains and mountain scenery. From a cursory glance it can easily be appreciated that the two principal components of a Japanese garden are indeed mountains (as represented by stones) and water (either real or symbolic). 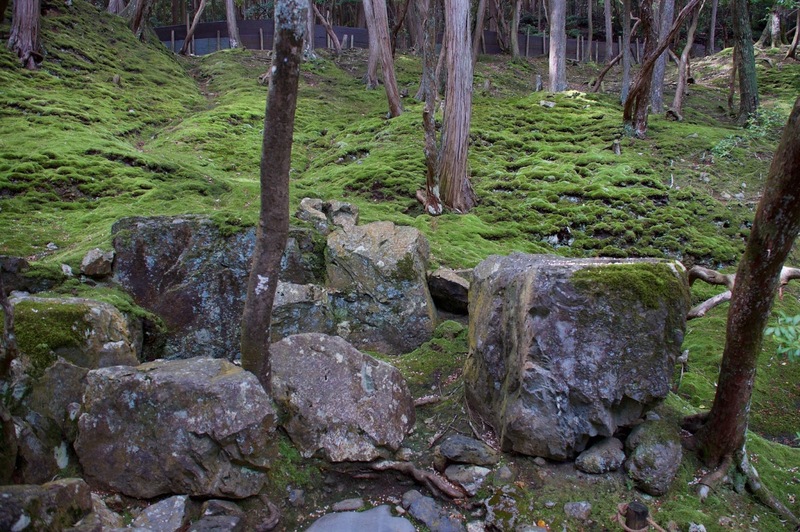 Even today in the field of creating traditional gardens in Japan the setting of stones, ishigumi, 石組, is regarded as a measure of the ultimate skill of a garden creator. Stones are accorded an almost reverential quality in the garden, and a great deal of care is taken in the selection and placement of stones. They are regarded as forming the essential skeleton of the garden, providing the garden layout with a fixed and subtle framework that will define the overall structure of the garden. Planting, that element of a garden so revered by Western garden makers, tends to be seen as adding flesh to the bones of a garden. In the East planting is complimentary to stone settings but ultimately subservient to the importance of stone arrangement. Perhaps this occurs because stones are perceived as adding a sense of permanence to a garden, whereas plants can be subject to an observable process of change and growth in the short term. 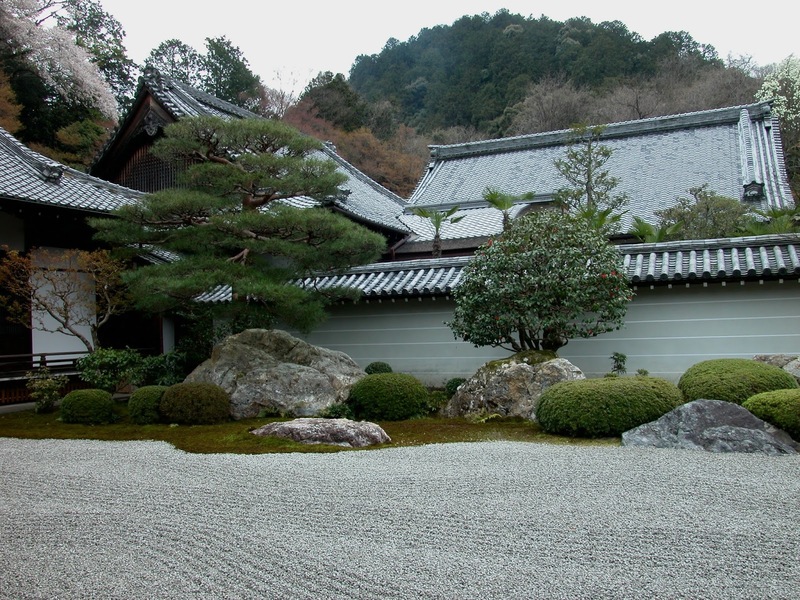 The types of stone used in Japanese gardens vary considerably in geological and mineral makeup. The choice of stones depends on availability and the intuitive sensibility of the garden creator. Stones with a provenience that may come from the status of previous owners are sought after and are considered highly desirable, also stones displaying eccentric forms are sometimes be used and can also be highly regarded. 1. Tall vertical; this is a stone taller than it is broad. It will stand upright, and very often be the focal point of a group. Can stand 0.9m (3’) or more from the ground. 2. Low vertical; much the same as above in essence, but a shorter piece. Generally below 0.9m (3’) in height. 3. Inclining; this refers to stones that have a pronounced diagonal form. They may incline left to right or right to left. Inclining stones are often used as support pieces in triadic groups. 4. Reclining; this refers to stone that seem to arch from the ground in a more or less symmetrical manner, that is without a pronounced inclination to the left or right side. 5. Horizontal: this refers to stones that sit low and flat to the ground, with a top that has a defined horizontal plane. Stepping-stones are an example of these stones. Stones have a dynamic visual energy within them. That is they are not regarded as being simply inert bodies occupying space. The overall shape of the stone, their texture and markings all give a sense of the energy that they are able to express. The stone illustrated below is a tall upright piece, looked at carefully it can be noted that particularly in the lower third of its bulk the graining of the stone has a sense of diagonal movement from right to left rising to the top left shoulder. Also looking at the overall bulk of the stone there is a subtle shift of weight that runs first diagonally from left to right, then shifts to run right to left to the top or head of the stone. These two ‘movements’ within the stone are complimentary and give a rising feeling to the stone. 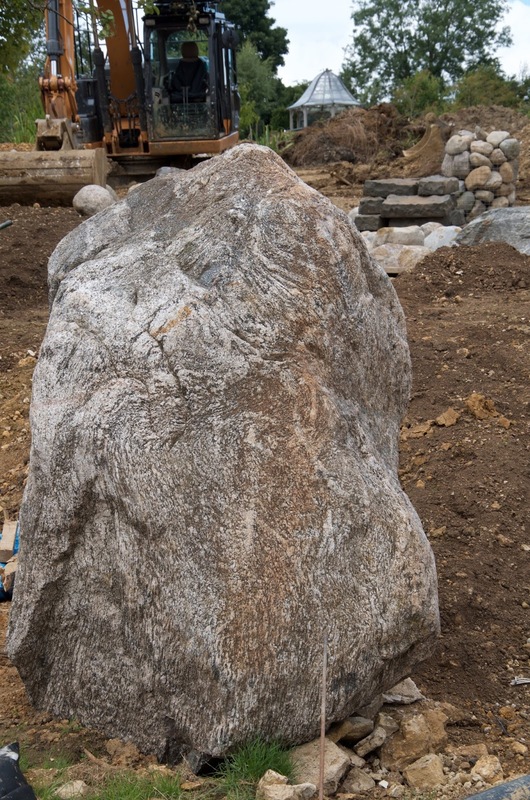 The stone in question stands about 1.5 m (5 feet) from ground level and this bulk combined with its encapsulated sense of movement gives the stone a feeling of power and presence. In the second stone illustrated, the overall shape of the stone is dominated by the rising shoulder running from right to left. In this stone the grain runs almost vertically from the ground upwards with light and darker minerals creating interesting vertical bands. Here the sharp contrast in the angle of the inclined shoulder and the vertical bands again compliment one another giving an added strength to the stone’s visual appearance. 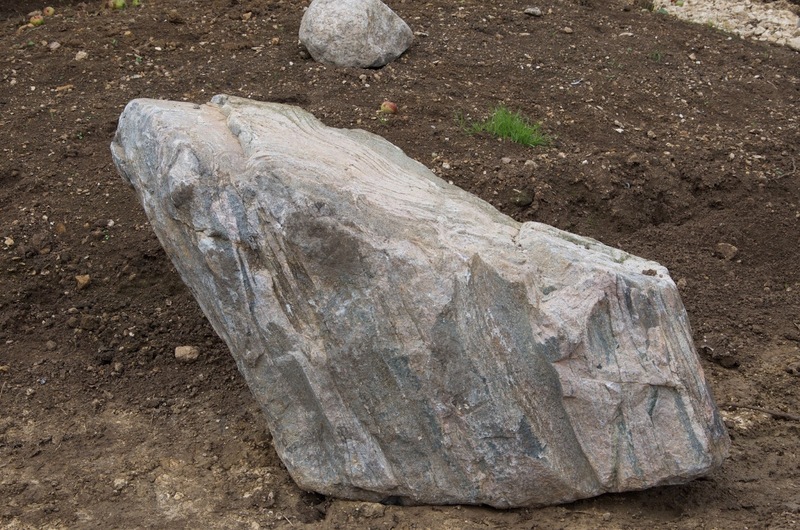 This stone would not necessarily make a dominant stone in an arrangement, but would set well as a supporting stone, set to the right hand side of a tall upright, so that the inclined shoulder points towards the top of an upright stone. 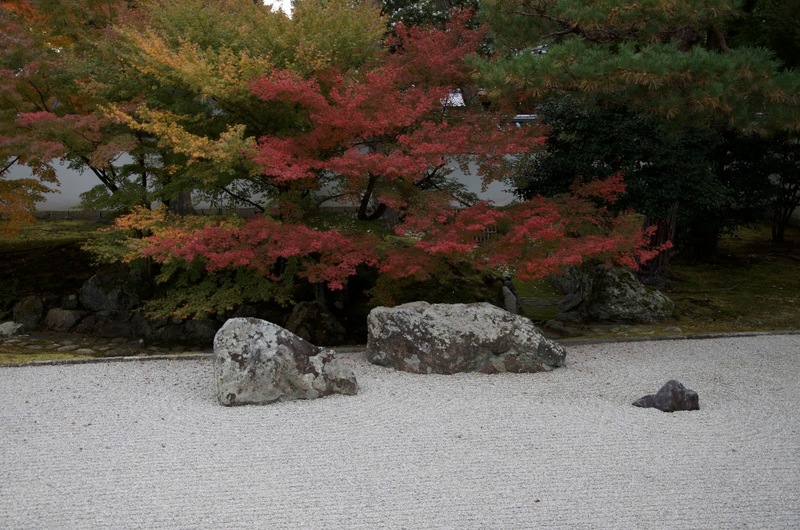 In a garden at Nanzen-ji temple, Kyoto can be found two fine examples of the use of reclining stones. The second stone (from the left) that is set low to the ground plane provides a visual link between the two larger stones set closer to the wall, it also has the function of emphasizing the bulk and height of the stones to the rear, as well as creating a sense of depth in the relationship between the three stones. Further to the right another reclining stone is also placed to the fore of the arrangement, which also functions in much the same way. A reclining stone does not draw particular attention to itself, but serves in a subordinate role, one that can be vital to an arrangement nevertheless. In creating a group of stones it is usual to first set in place a stone that acts as a dominant stone in an arrangement. This will often be a tall upright stone set in the background of the overall plan, each subsequent stone set will then refer visually back to the dominant stone. In this way the entire arrangement is tied together into a logical and harmonious entirety. Stones are rarely set in isolation, but most commonly arranged in triadic compositions. This is true of both individual stones creating a group, as well as groups of stones set across the entire scheme. In both cases it is important that individual stones and groups relate to one another in a harmonious manner. In Japan this spatial arrangement is commonly found in all the visual arts (such as painting and flower arrangement) and is known as ōshakei. The three elements of ōshakei are referred to as Heaven, Man and Earth; Heaven being the vertical dimension, Man the diagonal, and Earth the horizontal. Heaven expresses a quality of aspiration, Man the quality of dynamism and Earth the quality of stability. Vertical and horizontal forces are ‘fixed’ in the sense that they require the completion of the triad’s third element to provide a sense of implied dynamic movement. Where only two of the three elements are present then the fundamental opposition of the forces involved acts to cancel each other out, and the result can be a state of stasis or lack of movement. Most stone groups are composed with an uneven number of elements, the numbers three, five and seven being the most common. The reason for this is that even numbers are considered to be static, whereas uneven numbers are seen to hold a greater potential for dynamic energy or have a potential to imply change. A powerful expression of the triadic arrangement can be found at Zuiho-in temple (part of the Daitoku-ji complex, Kyoto) created in 1961 by Mirei Shigemori. The stone arrangement of the south garden also well illustrates the Japanese aesthetic preference for asymmetrical composition. The centre of the arrangement is located to the extreme right hand side, where a powerful group of five stones are located; at the rear of which a tall upright stands supported by two further upright stones descending in height and rising to sharp peaks. The stones are set close and the angles of the flanks of the stones blend seamlessly into one another providing a visual continuity that rising through the triad to the top (and beyond) of the dominant stone. To further enhance the grouping Shigemori set two further stones in close attendance; to the right is a lower inclining stone which features a peak that reflects the Dominant stone, its right hand side flank falling in line with a diagonal line that again continues to the peak of the Dominant stone. To provide a sense of stability to the group on the left side is a lower reclining stone set to lean into the main group, again the outline of this the fifth stone in the group perfectly aligns with the diagonal line running up from left to right that cuts across the verticality of the Dominant stone. The result is a powerful and dynamic arrangement that seems to rear out of the earth, yet it carries a sense of great stability and of being deeply rooted in the earth from which it springs. Shigemori adds depth to this section of the garden by placing another group, this time of three stones, at a lower level in the raked gravel. The Dominant stone of this triad has an angled top that moves the line of connectivity towards the upper five grouping, its sheer flat face very strongly vertical. This is tempered by a low, squat, upright with a slightly rounded top that nestles at the base on the left side anchoring the vertical movement. The whole group is then further anchored by the presence of a very low upright with a flatten top set to the right side. Setting this subordinate stone a little apart from the Dominant opens up a gap between what are otherwise closely set stones that in fact overlap one another. The flatten top of the stone combined with the spatial separation gives the sense of a spiralling movement that rises from this the smallest of the stones right through the entire group, allowing a smooth transition from the very lowest to the very highest. 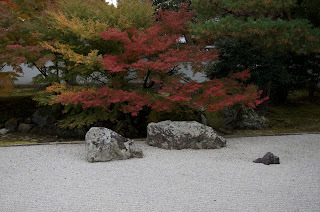 Shigemori further emphasises triadic element of the entire garden by extending the composition out along the left diagonal plane where it finishes and is held by a low upright stone set by itself in the heavily raked gravel. Between the main axis of the arrangement and this final stone he places several other stones to further reflect the dynamic movements and rhythms. Given that the garden is in a relatively confined space it carries a wonderful sense of flow, which manages complexity and simplicity, movement and harmony. Seen from the verandah the entire garden arrangement is further enhanced by the strong lines imparted by the boundary wall and clipped hedges. Here, these horizontal lines give the space a passive backcloth which throws the stone arrangements into greater relief, whilst at the same time providing a steady, soothing undercurrent to contain the movements. Shigemori’s garden creation manages to be both contemporary whilst also being respectful to traditions of artistic composition that have deep, ancient, roots in Eastern aesthetics. 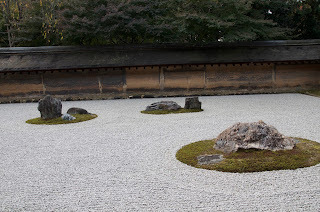 Whilst in a garden such as at Zuiho-in Shigeimori employs tight alignments between the forms of the stones to create triadic relationships, in a garden such as Ryoan-ji (created perhaps in the late 15th century), the relationships are more subtlety executed and less obviously defined. Here there is a greater emphasis on the overall disposition of one to another of the five groups of placements that make up the composition. The open spaces between the stone groups clearly have a greater role than simply providing a sense of differentiation and definition. Whilst appearing to be casual enough, the disposition of the stones within their respective groupings, and also between the groups themselves, is clearly the result of a great deal of sensitive aesthetic consideration. The stones themselves have little inherent drama in themselves, yet the overall effect is perhaps even more compelling and persuasive. A sense of mystery, of intrigue, stalks the garden like no other. Perhaps this is what draws the thousands of visitors to the garden. 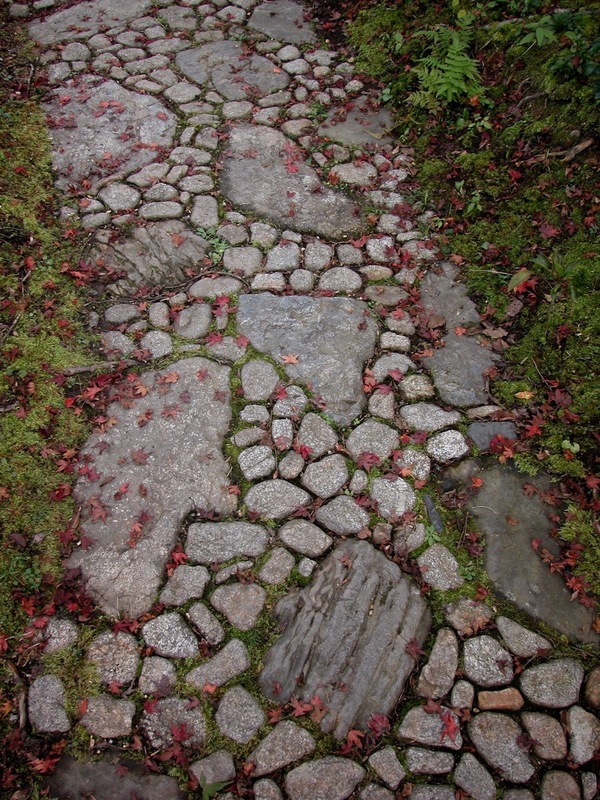 Stones used in such a way in a garden setting seem to act as centres of energy. Emanating from the stones seems to be some mystic energy that is contained within them; perhaps stones continue to radiate in some subtle manner the traces of the forces by which rock was created in the first place. Given that they are forces of energy of such a level of immensity that, ultimately, defy definition or comprehension. That stones may contain powers or energetic forces was clearly recognised in Sakuteiki, where an important section of the text is taken up with detailing a variety of taboos concerning stone placements and selection. In particular the text warns of the misplacement of stones, or the inappropriate placement of stones, and the dire results that can result from violating taboos. Such expressions reveal much of the attitude and perception people of that era had towards garden elements, one which we may consider today as being ecocentric, rather than anthropocentric. Stones, and plants, in a garden were recognised as having a energetic force or ki in Japanese (気). Shinto, the native religion of Japan, acknowledged all things, animate as well as inanimate, as having a life force that needed to be respected. Thus to perceive stones as being capable of influencing human affairs would have been quite natural, ultimately all of Nature was to be revered as a divine expression. Rather than being superseded by the establishment of Buddhism, this ancient geomantic view was overlain by an expansion of expression. Hence by the Middle Ages in Japan the practice of naming of garden stones became a common practice. Naming is a way of both animating a quality, but also projecting qualities on to an object.The names for stones were derived from Buddhist, Taoist, Shinto and Confucian sources, as well as stones being named for their function and for scenic effects they purported to hold. Therefore we have a three stone arrangement known as Sansonseki (‘Three Deities stones’), which evokes the presence of the Buddhist trinity (the interpretation of which deities varies widely, but may include Dainichi Nyorai 大日如来, Amida Butsu 阿弥陀仏 and Kannon 観音). The Sakuteiki notes: “ If a Buddhist Trinity (sansonseki) is placed in the southwest, there will be no curse, neither will malevolent spirits be able to enter.” One may speculate from this that the purpose of sansonseki in the garden was to provide a protection to the household. Another Buddhist deity that frequently is associated with gardens is Fudō Myōō 不動明王, this protective figure is associated with waterfalls possibly through his adoption by the mountain priests of the shugendō sect of esoteric Buddhism whose rigorous training in mountains such as Mt Heiei, include purification by standing under waterfalls. A large flat-topped rock is often referred to as a zazenseki, or a meditation stone, as it may well have been placed for precisely that purpose and can be found in several gardens, such as at Saihō-ji, the ‘Moss temple’ near Kyoto. 'Rock of the Spirit Kings' (shinnōseki), 'Never Aging Rock' (furōseki), 'Rock of Ten Thousand Eons' (mangōseki), 'Bufo Rock' (gamaishi), all these are names derived from Taoist iconography and have associations with the notion of paradisial islands. ''Master Rock (shugyōseki), 'Attendant Rock' (shinseki), 'Yin/Yang Stones (inyōseki), 'Status Rock' (kanseki); all these names have Confucian significance, where social status and order is a prime concern. Shinto references are more vague to deduce but given the animistic content of Shinto iconography stones that refer to animals probably have some significance, such as 'Duck’s Abode stone' (kamoi ishi), and 'Flying Birds rocks' (toritobi ishi). 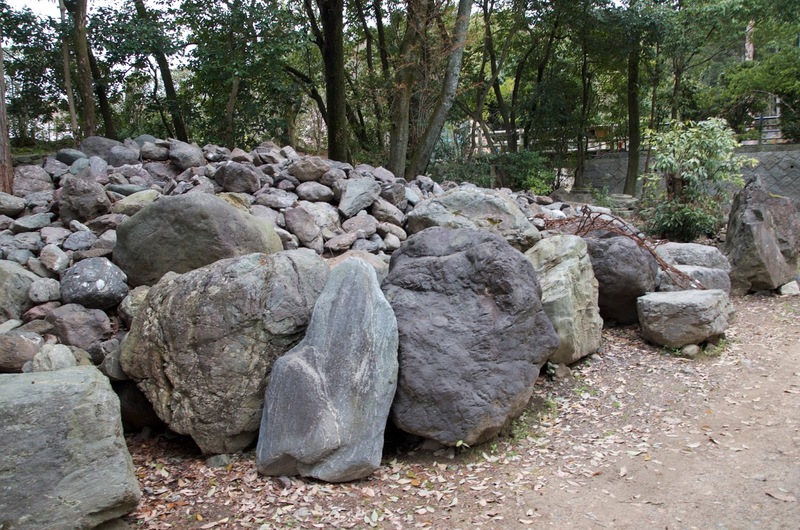 Stones found in natural settings known as iwakura have definite associations with Shinto. These are regarded as being places where deities either abide or places at which they may have some communication with humans. Usually iwakura are very large stones and are delineated by a harness of rice straw rope draped around them. Very occasionally such stones are found in the precincts of shrines and temples, through garden use is not at all common. Teishuseki (亭主)石 'Host’s stone'; this would be a broad flat stone placed so to give a prime view over the garden. Teshoku ishi (手燭)石 'Lamp stone'; a flat topped low stone places to the left of a water basin for evening or night tea ceremonies. Yutō seki(湯桶石) 'Warm water basin stone', a low flat topped stone set to the right side of a water basin, it holds a basin of warm water for winter or cold season tea ceremony. Sekimori ishi (関守石) 'Barrier stone'; a convention of the Tea garden, a fist sized stone wraped with sisal which may be placed on a stepping stone, it indicates that particular path is closed and guides a visitor along an alternative path. Kutsunugi ishi (沓脱石) 'Shoe leaving stone'; a long low flat topped stone at the entry point to a building where outdoor shoes are left before entering. Namiuke ishi 浪受石 'Wave dividing stone'; a stone placed in a stream that is intended to split the flow, often creating a small pool of sound. Sancho seki 山頂石 'Summit stone': a stone set on a earth mound or hill in the garden. Sawatobi ishi 沢飛石 'Water crossing stones'; stepping stones set across a stream or shallow pond. Shumisen ishi須弥山石 'Mt. Shumisen stone'; a tall upright stone that evokes the mystic Buddhist mountain, also is generally read as a paradisial symbol. Funatsuki ishi 船着石 'Boat Landing stone'; flat stones set into the bank of a pond from which one steps onto dry land after disembarking. Boating was a popular activity in the larger stroll gardens. Such stones are sometimes used in gardens where the pond is too small to use for boating, but their presence still would evoke the idea of boating. Dōjiseki 童子石 'Children stones'; usually a scattering of small stones offset from a prominent stone, the effect is of a scattering of children running about. The pattern of the layout of such stones would be carefree and intentionally unstructured. It should not be taken from the above notes on names that a garden is required to be composed of named stones, there are many gardens whose stone placements have not been designated any ‘meaning’. 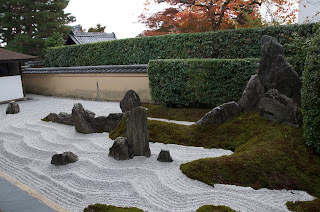 Gardens where the stones are arranged purely for visual and/or spatial purposes. Undoubtedly in the Edo period in Japan (1603-1867), the use of named stones in gardens became very popular, almost formulaic. The intention of this was generally to evoke associations in the mind of the viewer thereby increasing the level of engagement that the viewer could have with the garden. In garden manuals complied about that period and earlier stones are certainly designated names, but there was no standard for this, knowledge of garden making techniques was subject to guild like limitations. One had to be an initiate into the practice to know of certain things, and teaching related to garden making was passed from generation to generation orally, much as it still is into the 21st century. A successful stone arrangement is one that recognizes that the primary material that the garden creator works with is not simply the outward form of the stone but its inner energetic patterns. A stone today has come to appear a certain way through the unique configuration of the forces of its creation as stone, weathering, patina and also its history. 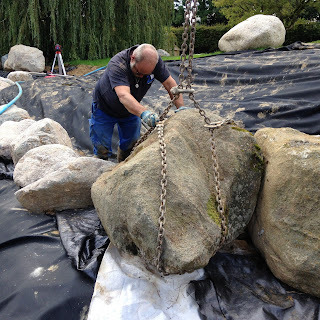 This process has taken millions of years to achieve, it is easy to overlook and take this for granted, but it is something that is important the stone arranger or garden creator needs to bear in mind. Perception and a profound sensitivity to the materials with which one works, is a vital element in the creation of any artwork. 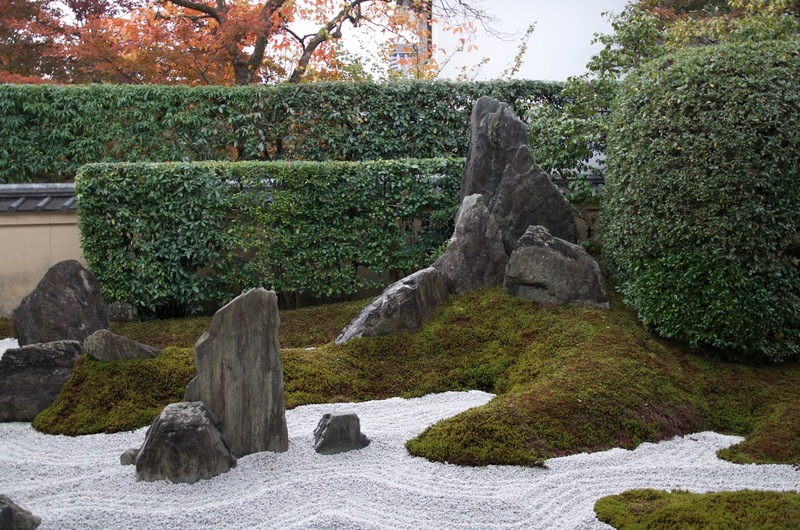 Blending a group of stones together into a coherent whole, whilst allowing space and time for the imagination of the viewer to be part of that process of recognition and comprehension, is something that is absorbed as part of the training of a Japanese garden creator. This principal extends right through the garden, through the use of planting, the relationship between buildings and the garden and by the use of land-shaping and the relationship between the garden and its external environment too. 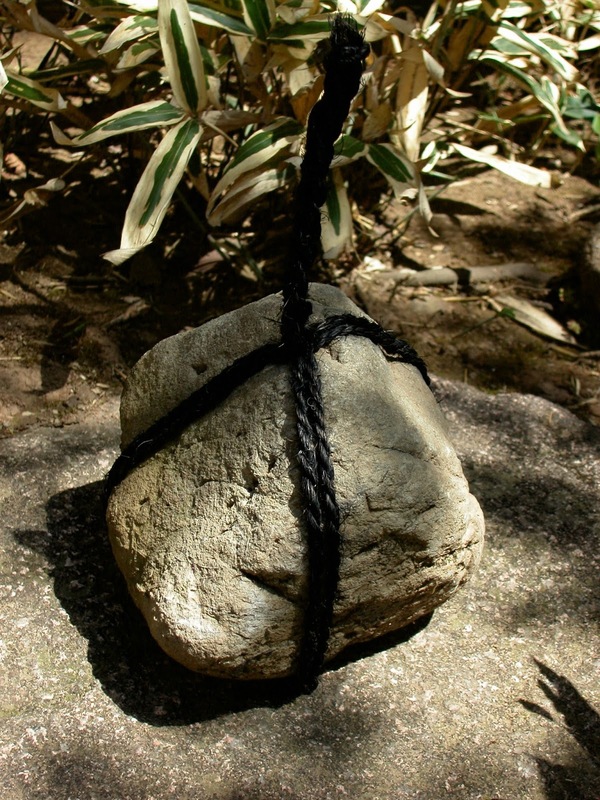 Thus the practice of setting stones becomes an art form in itself, employing aesthetic concerns, as much as techniques concerned with rhythm, space, pattern and any symbolic content that may be projected through the work. The garden is not a formulaic construction and it draws deeply on the sensitivity of its creator in order to work well, that is, for the garden to reach and communicate with the viewer the garden creator has to find the very qualities he or she wishes to project outwardly with themselves. The movement outwards is also a movement inwards. Above all, in practice the selection, use and setting of stones becomes an intuitive practice in experienced garden creators. 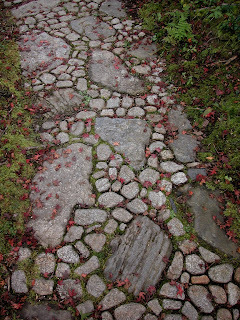 The Sakuteiki is clear that the stone setter should ‘follow the requesting mood of the stone’, and this is probably the most important element of the use of stones in the Japanese garden. It is not so much the ego of the garden creator that is of principal importance, but rather there is a process of sublimation of the creator’s ego to recognise the primacy of the materials themselves. The garden creator trains his or her eye and heart to see the materials as they are, and to be able to use them as such. Interpreting the requirements of site, client and materials is the key to successful garden making. 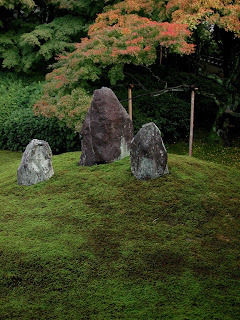 Nowhere is this more apparent and important in the setting of stones that has been noted above is one of the key practices in the creation of Japanese gardens. It has always been so, and no doubt will continue to be so. ‘Records of Garden Making’ compiled in Japan in the 11th century, perhaps the oldest garden manual in existence, and still referred to by contemporary garden makers. See translation by Takei and Keane. Published by Tuttle, 2001. Kose no Hirotaka, an artist and garden designer, late 10th/early 11th C Japan. All quotations from Sakuteiki, see footnote above. If you enjoyed this blog then try my Facebook page, Robert Ketchell Garden Design. Feel free to leave comments there. Good gardening. If you enjoyed this, or any other post, please let me know! 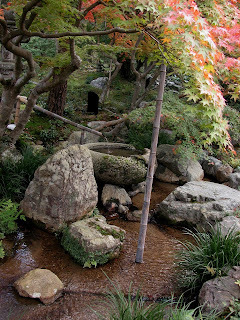 If there are specific aspects of the Japanese garden tradition you are interested in, please let me know. Thanks.